Renee Kane is one of our many New Castle Library Friends’ volunteers. You may know her from her involvement in the Telling Our Story Project. Born in Pennsylvania, she moved to New Castle with her family in 1969, when she was in middle school. It was not until five years ago that Renee dropped into the library, where she met Julie Kirk, who introduced her to the Mystery Book Club. That same summer, she joined Sally Hatton’s Genealogy Group, where Renee heard about Sally’s plans for the Telling Our Story Project, which was framed on NPR’s Story Corps @ Your Library. Our story project was comprised of storytellers who lived or worked in New Castle, interviewed by close friends or family members. Sally Hatton was the Project Coordinator, who worked alongside a committed and dedicated group of volunteers. Renee was one such volunteer, who immersed herself in every aspect of the project. Renee’s involvement with this project was a natural fit. She studied Computer Science at the University of Delaware, and she is a retired Information Technology (IT) Project Manager, who had experience interviewing guests for her church’s (Victory Christian Fellowship) internet talk show, “Straight Talk for Women Only.” In this volunteer position, Renee was a producer in charge of pre-interviewing guests and developing the scripts for the host. For our project, she held workshops to help each pair of storyteller and interviewer capture a story, write the script, and rehearse their parts. Transferring these skills came easy to Renee, but there was so much more to learn. Next, Renee tackled the art of audio recording and audio editing. Once ready for the next step, Renee set up a conference room as a recording studio and turned the lower level of the library into a sound proof area with multiple signs for “Silence”. As each session was recorded, Renee was at the control panel. She then edited each audio recording, prepared a transcript of what was recorded, and scanned a photo of the storyteller. Finally, the audio, transcript, and photo were uploaded to the Delaware Heritage Collection website. A public celebration of this project, hosted by the Friends, took place in September 2017, but a few stories remain to be told. By the Spring of 2019, Renee hopes to wrap up the collection and upload accompanying personal photos to illustrate each story. The final pieces will include Renee’s story of choice, when she was an extra in Oprah’s movie, Beloved. She will be interviewed by her good friend, Tina Morris. Renee Kane is a remarkable individual. She is such a positive person. She attributes her attitude and drive to the book, The Magic of Thinking Big by David J. Schwartz, PhD. She first read this self-development text when she was 19, and recently revisited it. She embraces retirement as a “new lease on life.” And she sees volunteerism as an avenue to an enriched life, which has broadened her perspective and introduced her to a myriad of new friends. As a member of the New Castle Friends and an outstanding library volunteer, we are thankful for Renee’s dedication and appreciative of the fruits of her labors-our story project. As the last of the stories are captured, may Renee find time to squeeze in a few of her favorite pastimes, which include fine dining, live performances, and movies. Leanne Keyes is our Technology Aide. She holds a BA in Business Administration from Goldey Beacom College and has been a member of the New Castle Public Library since July 2017, following a 20 year career in banking. Banking kept Leanne’s technical skills sharp, but she found the work unfulfilling. A native of New Castle, the library was always a peaceful place for Leanne, and now affords her an avenue to share her skills. As Technology Aide, Leanne initiated and runs the weekly Coding/Robotics Club for 8-14 year-olds. They meet every Monday at 4. Every Thursday from 3-5, Leanne facilitates the Tech Lab where individuals can familiarize themselves with computer technology and also seek job search support. While on the floor of the library, Leanne can be found close to the computer stations fielding questions. Leanne also works part-time at St. Peter’s School library. The best part of her job is witnessing those “Ah ha” moments when a student or adult grasps a concept or discovers what they were searching for. The challenge in the ever-changing field of technology is the necessity to remain current. This is a challenge Leanne loves and embraces. Leanne is the mother of a twelve year old son. She enjoys documentaries and reading. Her favorite genre is Children’s and Young Adult Literature. Leanne’s quiet nature is a balm in the field of technology that baffles and frustrates so many. Thank you, Leanne, for sharing your talents, while growing the skills of others. Lynne is well experienced for this position with us, for she has 30 plus years as Circulation Supervisor at the Delaware Tech Library. She plans on retiring this June from her full-time position at Del Tech, and perhaps will pick up a few more hours in New Castle. Born and raised in the Rosehill Gardens area of New Castle, Lynne graduated from DeLaWare High School, class of 1974. She is married, with two children, and two grandchildren. When sharing about her interests and hobbies, Lynne referred to herself as a “Foodie”- loving anything barbequed. She also enjoys traveling. Her trips have included California, Las Vegas, Florida, and Tennessee. Lynne also enjoys shows and travels twice a year to New York City to take in the sights and sounds of Broadway. In May she will see The Lion King. Lynne likes shopping and reading, and just finished Danielle Steel’s novel Fall from Grace, but she especially enjoys listening to audio-books on her daily commute. Thank you, Lynne, for your service with a smile. You are yet another library staff member in place to make our experiences at NCPL pleasurable. When I arrived to interview Nicole, I found her at the desk in the children’s section, fielding reference questions from a computer area patron and arranging an inter-library loan for another patron. These activities are just the tip of Nicole’s responsibilities. 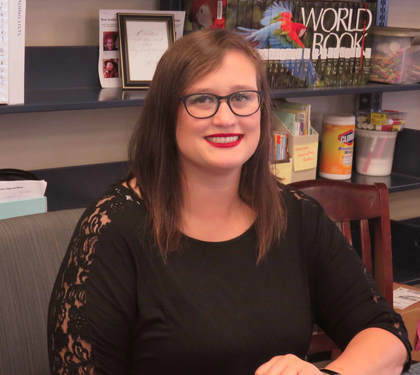 As Principal Library Assistant, Nicole is supervisor of circulation, which includes training pages and circulation staff, as well as dealing with fines and worn books. She is also in charge of the Library’s Facebook Page, where she will post this newsletter. She enjoys the varied aspects of her job and meeting with fellow Principle Library Assistants to share common challenges and solutions. Nicole is a life-long New Castle resident. She remembers getting her first library card from Jackie Harrad, our former Youth Services Specialist, and working here while an undergraduate student at the University of Delaware, pursuing a degree in secondary English education. It was while substitute teaching at William Penn High School that Nicole attended a student book club that Sarah Thomas was running. It was at this point that Nicole’s career took a turn. Watching Sarah interact with youth, while discussing literature, Nicole could see her love for literature, teaching, and service take form in a library setting instead of the classroom. Nicole next took a position at West Chester University’s library to explore and expand her library experiences. She has been employed at NCPL for the past 5 years. Nicole’s proudest accomplishment is her acceptance into a Master of Library and Information Science degree program at Florida State University, and her ongoing feat of working full-time, while going to school full-time. She truly loves being able to directly apply her studies to her daily library work. With work and school, there is little time for anything else, but Nicole still manages to read for pleasure and run. She and several library staff members recently participated in a 5K for PAWS for People, a program the Friends sponsor here at the library where children read to dogs. Nicole’s favorite genre is Young Adult Literature, with the Harry Potter series taking first place in her best reads category. As my time with Nicole drew to a close, I was struck by her passion for literature, teaching, and service, and her true love for this library, where she can share her passions. Nicole has found her perfect career, and we have found another outstanding staff member. Preethy Cherian has been part of our library community for the past five years. During this time, she has held three positions: Library Assistant, Principle Library Assistant and currently she is our Library Specialist. Prior to working here Preethy’s educational background was in language and literature. She thought she might want to teach, but a position as an aide opened at the Hockessin Library, which allowed Preethy to experience and embrace library science. Her move to New Castle Library was a natural fit and career progression. 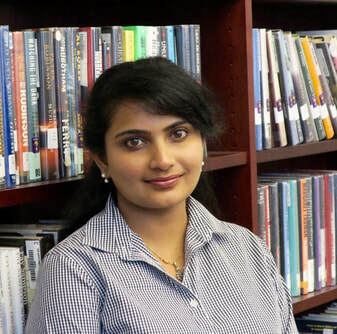 As Library Specialist, Preethy’s duties include the following: providing reference and information services, maintenance of DVD and music CD collections, Interlibrary Loan liaison, volunteer coordinator, and serial processor. One initiative Preethy is especially pleased with is the Monday night Cultural Movies Series. Recognizing a change in local demographics, Preethy wanted to promote respect for differences, tolerance, and understanding. She wanted to use storytelling as the catalyst and she chose movies from various cultures as the vehicle. Each month a different movie is screened. The next cultural movie is scheduled for September 11, at 6 PM. The film to be viewed is The Reluctant Fundamentalist. All are welcome. Preethy enjoys travel. This July she ventured to Italy and England. She also enjoys new cuisines, and reading is a favorite pastime. Her favorite genre is biography. Preethy lives in the Pike Creek area of Wilmington with her husband and young son. New Castle Library is fortunate to have Preethy Cherian as a dedicated staff member. Barbara Fiala has been an Administrative Aide with the New Castle Library since 2006. She packs a myriad of activities and responsibilities into this part-time position. Barbara is in charge of in-house supplies, and in-house publicity, which includes bulletin boards, posters, and display windows. Barbara also writes the weekly news article covering library activities, Inside the Library. A favorite part of her responsibilities is maintaining the on-going book sale, while her proudest accomplishments are the March display windows featuring Dr. Seuss and the library’s Seuss birthday celebration. Barbara was raised on Long Island, New York, and arrived in Delaware in 1995, following 30 years in Chicago. 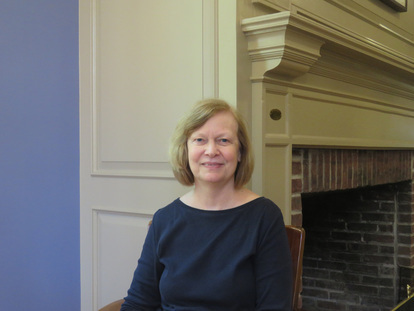 A Liberal Arts degree in English and history serves as Barbara’s knowledge base. Work experience in computer time sharing, as a church secretary, and as a book seller for Borders enhance her present library work. Barbara’s passion is books, which has fed her interest in cosmology, physics, and astronomy. Her favorite genre is non-fiction, but she also enjoys classic British mystery stories. Gardening is also an obsession, along with ecology. At least three times a week, Barbara makes it a point to walk along Route 9 picking up litter. She hopes her actions will serve as a model for others. Her goal is to eventually walk for the pure joy of walking in a litter-free environment. Last year, Barbara started an adult summer club called Walk and Talk. This summer she plans to engage the group in litter pick-up, and call the club, Walk, Talk and Pick. We can thank Barbara Fiala for all she does in quiet service to make our library and our town beautiful and inviting. ​The welcoming smile at the circulation desk belongs to Fern Toner-Horisk, Library Aide here, at the New Castle Library. Fern is a life-long Delawarean, who presently resides with her husband Jack in New Castle. Early in Fern’s career she worked for The News Journal. When Fern’s three children were young, she was a stay-at-home mom, reentering the work force once her youngest child started kindergarten. 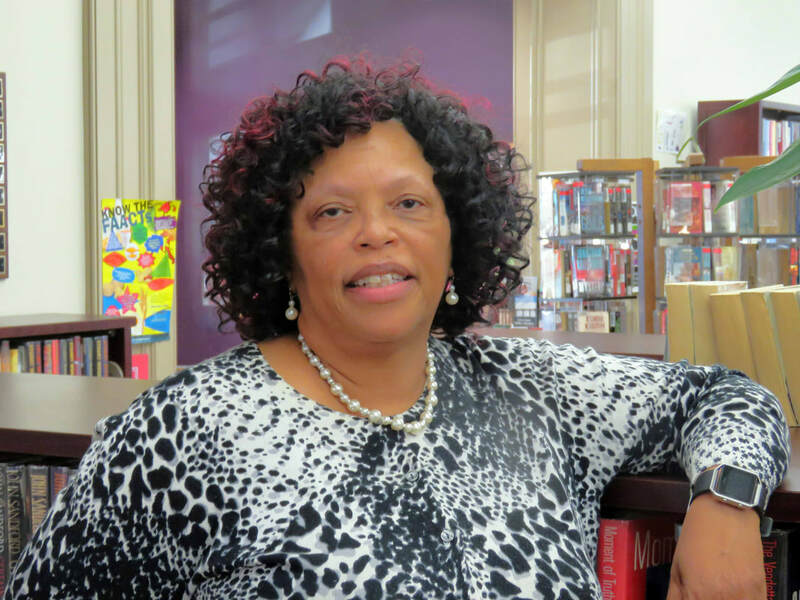 She made her reentry into employment holding down a full-time position at Wilmington Trust and a part-time job, initially at the circulation desk at the Bear Library and then in 2000, at New Castle. Fern retired from Wilmington Trust in 2005, just in time to help care two days a week for a new-born granddaughter, while she continued her work at the library three days a week. This rewarding arrangement continued for five years, until her granddaughter entered kindergarten. Fern now focuses her time and talents to her ongoing, part-time, library work. When asked what her favorite part of her job is, Fern, without hesitation said, “I love everything about my job. No two days are the same.” She especially enjoys her interaction with the community and her co-workers. The size of the library allows for friendships between patrons and staff to blossom, and the staff remains like family. Fern enjoys learning about the families and travels of library regulars. In Fern’s free time she enjoys baking and reading. Her favorite genres are history and cook books. Fern also loves music. She has played piano since age eight, and she loves to sing. Fern Toner-Horisk represents the essence of our town library. She is warm, welcoming, knowledgeable, and above all, helpful. Thank you, Fern, for a job well done. As of December 20, 2016, Sara Thomas has taken over the position of Youth and Teen Services Librarian. A well qualified candidate for the job, Sara has been with the New Castle Public Library for 4 years, with a total of 10 years experience in the library field. Sara grew up in Newport, Delaware, and is now a proud New Castle homeowner, with her 6 year old, rescue cat, Angus. 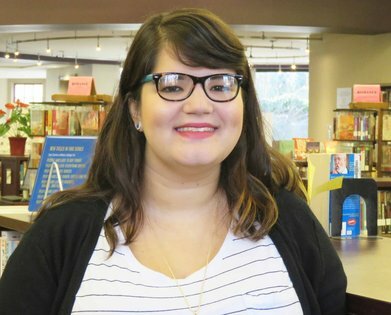 At the age of 18, working a summer job in a local library, Sara knew Library Science was the field she wanted to work in for the rest of her life. She received her BA in sociology from University of Delaware and a Masters in Library and Information Science from Rutgers. Sara’s proudest accomplishment to date involves a grant award from the American Library Association, which allows her participation in the Great Stories Club. With this award, Sara established a weekly book group at the Ferris School for Boys’ Cleveland White School. Here she meets with young men of varied reading abilities, and together they share the experiences of others by reading memoirs, stories, and graphic novels. Training and materials are provided through the grant. This has been a rewarding experience for Sara, as she is able to give back to the kids. She is presently in the process of applying for phase two of this grant, in order to continue this valuable program. Sara has exciting plans for future library programs. 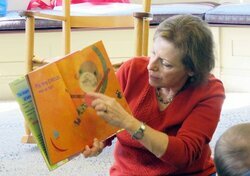 She hopes to expand Story Times for other ages, and establish Saturday programs, along with Family Movie Time. Sara has already implemented the STREAM (science, technology, reading, engineering, art, and math) program, which features a different activity each week. This program is geared for youth, ages 8-15. When Sara is not library focused, she enjoys the company of her friends, attending local concerts, and reading. Her favorite genre is Mystery-Thillers, but she remains a huge fan of Harry Potter. We wish Sara well in all of her new ventures as Youth and Teen Librarian. Her work enriches our community by involving our youngest members and their families. Thank you, Sara. The next edition of Footnotes will feature the staff bio of Circulation Aide, Fern Toner-Horisk. Jackie Harad is a fixture at the New Castle Public Library. She has spent the last 24 years here as our Youth Services Specialist. A first generation American, native of New York, Jackie earned her BS degree in Education and Sociology from Hunter College. Upon graduation, she married, moved to Delaware and took a 1st grade teaching position, followed by a Kindergarten teaching position. While raising her growing family, Jackie worked at pre-schools before moving to the post of Early Childhood Director at the Jewish Community Center in the Brandywine Hundred area. This position was followed by Assistant Director at the Goddard School. Looking back over the years, Jackie is proud of the community partnerships that have developed. The Summer Reading Clubs have partnered with the Colonial School District’s food program to provide lunches at the library twice a week during the summer for children ages 4-17. Gingerbread house building and the celebration of Dr. Seuss’s birthday will continue in partnership with the culinary department at William Penn, under the direction of Kip Poole. She also was responsible for bringing the PAWS reading to the library. Jackie and Gary will soon be moving into a 55+ Community in Boothwyn, PA. They share the joy of five children and eight grandchildren, who are scattered across the United States: west to Colorado, southwest to Texas, and east, across the Atlantic, to Paris. Jackie is never short of suggestions for good reads. Her children’s literature favorites include the works of J K Rowling, Kate DiCamillo, and Shel Silverstein. Historical fiction is her favorite adult genre. Books on tape are frequent companions of her daily commute to work. We are sad to report that Jackie’s rich career with the New Castle Public Library is drawing to a close. December 28th will mark her last work day and the beginning of her retirement. Traveling to see family is top on her to-do list, which also includes knitting, volunteer work, and time to read. The Friends, along the New Castle community, wish Jackie well in this next phase of her life and thank her for her years of dedicated service. Sally Hatton is our Adult Services Librarian here at the New Castle Public Library. She has been on staff at NCPL since 1980. She received her BA in English from University of Delaware in 1972, followed by her Masters in Library Science from Drexel in 1986. 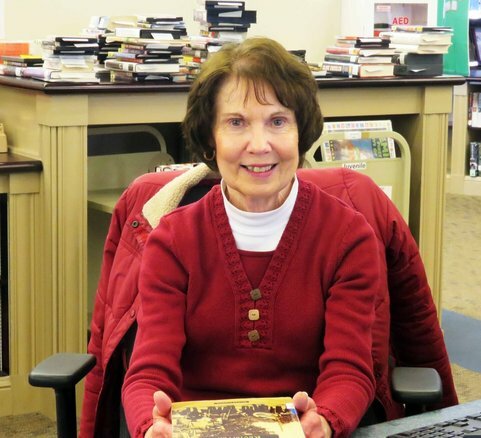 Sally began her library work at the Corbit Library in Odessa, at the age of 16 shelving books, typing out catalogue cards, and covering the Circulation Desk. Over time, Sally has taken part in the modernization/computerization of today’s library operation. Sally is a native Delawarean, who loves working in a library that is nestled in the community, where patrons can conveniently frequent and gather. Her duties include adult book selection, adult reference, and adult programs, along with leading the Tuesday Night Book Group and the Genealogy Group. Sally cherishes the multitude of contacts and friends she has made here in New Castle. Sally’s proudest work is the implementation of a program entitled “Telling Our Story”, which is based on the StoryCorps model, a national project to instruct and inspire volunteers to record the lives of everyday people in their community. Since August 2015, 50 people have attended project meetings, recruited volunteers, and served as storytellers and interviewers. The process of interviewing and audio-taping 20 individuals, ages 60-98, who have ties to New Castle, has been heartfelt. The project’s completion date is set for early fall and will culminate with an evening of sharing with the volunteers, the interviewers, and the storytellers. Outside of Sally’s work life, she loves books and music. As a youngster Sally played the clarinet and the piano, but as an adult she was drawn to the instrument of her maternal grandparents, the violin. She therefore enrolled in the Music School of Delaware for violin instruction and today she plays violin with the Brandywine Pops Orchestra. The lives of New Castle Public Library patrons are enriched by Sally Hatton and the many roles she plays as Adult Services Librarian. Talking with Julie Kirk is to experience the enthusiasm and vitality of someone who loves her job. We are truly fortunate to have her as the Director of the New Castle Public Library, a library where she has had personal experience in a variety of positions, as she worked her way up through the ranks to her present executive position. Born in Towson, Maryland, Julie says she gravitated naturally to the local library, where she enjoyed long hours of contented reading. “I felt very secure and happy there. I know it is cliché,” she admits, “but I really love reading.” Julie earned her BS degree in education from the University of Delaware in 1988. While earning her undergraduate degree, she worked part time at the University’s Morris Library circulation desk. In 1990, she married Tom Kirk and today they have a daughter, Carrie (22) and a son, Dylan (16). It was Tom, a born and raised New Castilian, who wanted to move back to Old New Castle, where he had family and long standing ties with the community. In 1999, Julie found herself here with a young daughter and a baby. In 2001, Julie’s love of books brought her back to library work, this time at our New Castle Public Library. She started as a Page, moved to Library Assistant, and was then promoted to Library Specialist. When the position of Director opened at the end of 2011, Julie applied and was hired, with the understanding she would pursue a Master of Library and Information Science degree. She entered this course of study at Drexell University in the spring of 2012, and was awarded this degree two years later, in the spring of 2014. During this time, she was working continually as Director, wife, and mother- surely a tribute to her determination and dedication, qualities which serve her well as Director of the New Castle Public Library. Julie is appreciative of the supportive staff and their initiatives. She insists that she could never manage the library successfully without them. She also believes in volunteers and has extended the involvement of these hard-working individuals. In addition, Julie is pleased with the relationship she has developed with library managers and administrators within the county. Beyond her director’s duties, Julie has found time to organize and maintain a book club for mystery story enthusiasts, appropriately named, “The Usual Suspects”. She appreciates the New Castle Library Friends and says she is delighted with our increasing financial support, which has enabled programs, such as Paws, and the Lego program, along with the Summer Reading Club. The Friends also supported the digitization of local newspapers, which date back to 1938, and the establishment of the Library After Hours program. The Friends and patrons appreciate Julie’s dedication and leadership. Julie is the director of our library, pumping life into knowledge, opportunity, and action. @ COPYRIGHT 2016 NCLF. ALL RIGHTS RESERVED.